Today I am super excited to welcome Cleo Coyle to Escape With Dollycas!! Like my husband (and partner in crime-writing), I grew up in a small Western Pennsylvania town among a family of food-loving Italian Americans. Although Marc and I were raised in the same region, we didn’t meet until we finished college and moved to New York City. Here is where we fell in love and made our home. Because we grew up outside NYC, we have a special relationship with the city. In some ways we’re tourists who never left. So when we want to get away from our daily grind, we do what 50 million other tourists do each year: We escape to New York! The winding lanes, secluded gardens, quaint cafés, and historically preserved townhouses make this neighborhood one of the most picturesque in the entire city, which is why we chose to give our amateur sleuth, Clare Cosi, a home here, above a century-old coffeehouse called the Village Blend. 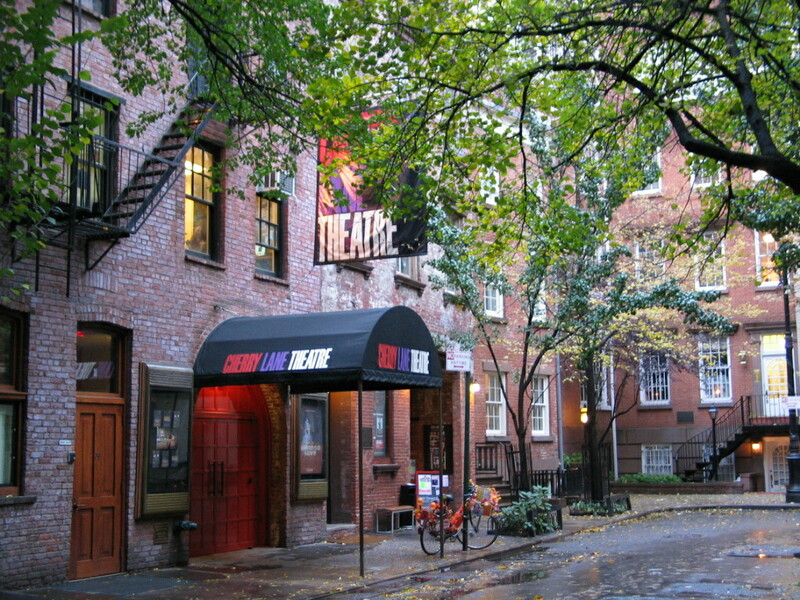 As we all know, a cozy mystery series is typically set in a little village—and, in many ways, Greenwich Village is exactly that. Marc and I know first-hand what it’s like to live in the real NYC, among families and hard-working folks. Like residents of small towns, we New Yorkers become quite attached to our neighborhoods. We join community boards, walk our dogs, and throw block parties and street fairs. We also become friendly with—even depend upon—the people who run our local stores, restaurants, and libraries (again, just like residents in small towns). What else makes our series cozy? The characters. In every book, our characters show love and support for each other. From our coffeehouse manager to her quirky band of baristas, the goodness of our cast is the light that shines through the darkest New York night. Of course, we can’t argue the fact that New York has seen many dark nights (and days), but nothing symbolizes its rebirth more than Bryant Park, a gorgeous public space located in the heart of Midtown Manhattan, right behind the main branch of the majestic New York Public Library (a worthy destination in itself). With its rows of London plane trees, Bryant Park is an urban paradise. 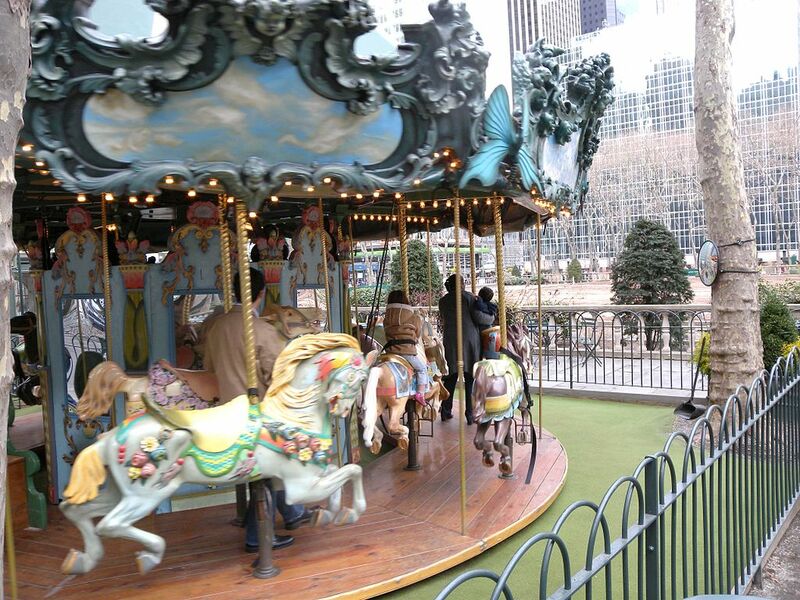 Don’t miss the lovely hand-painted carousel. We used this very merry-go-round as a setting for murder in our 12th Coffeehouse Mystery, Holiday Buzz. And yes, we confess to staging a little mayhem at this location in our 3rd series entry, Latte Trouble. 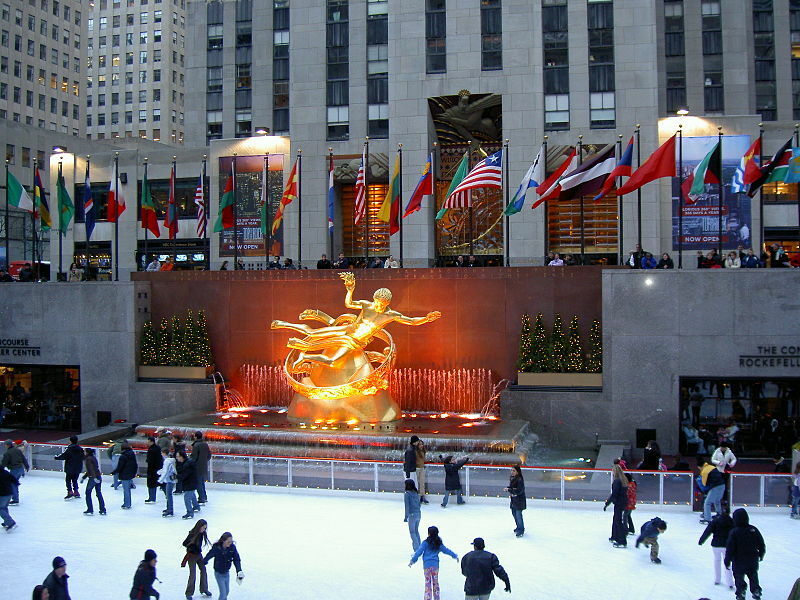 Clare Cosi and her ex-husband, coffee hunter Matteo Allegro, taught their daughter to ice skate under the famous Golden Prometheus statue at Rockefeller Center. In Murder by Mocha, Clare discovers a crime victim at the Rock Center’s Loft and Garden, an incredible open, rooftop space high above Fifth Avenue, which features a spectacular view of the spires of St. Patrick’s Cathedral right next door. 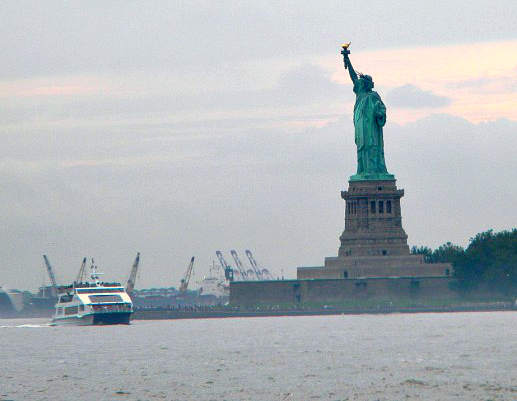 Lady Liberty is an awe-inspiring sight, whether you’re gazing at her grand visage from Battery Park in Lower Manhattan, the deck of the Staten Island Ferry—or the icy waters of New York Bay! When Clare Cosi is thrown into those frigid waters in Holiday Grind, she uses Miss Liberty as a mental lifeline. Lucky for Clare, a New York Fire Department boat comes to her rescue, which leads to complications in Roast Mortem, the book that follows. The Central Park Zoo, Shakespeare in the Park, and Strawberry Fields are famous. But lesser known attractions are just as charming. 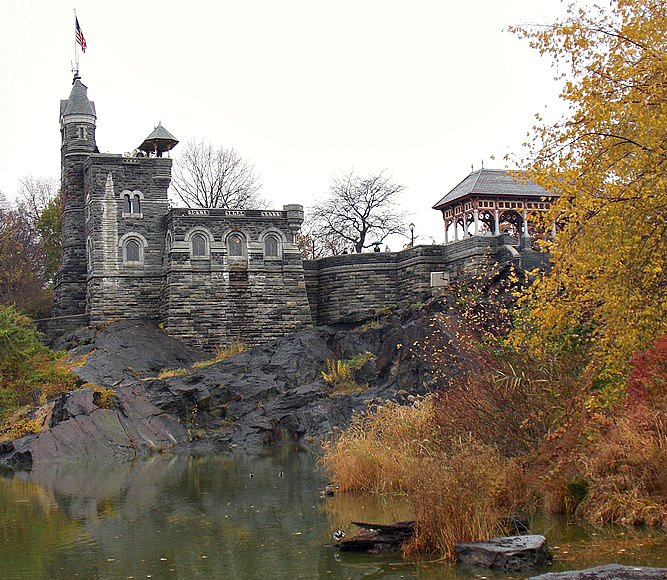 The Alice in Wonderland Statue, for example, is a whimsical delight; and Belvedere Castle, a fairy tale folly, crowns one of the highest points in Central Park. Below the castle you’ll find The Ramble, a tangled stretch of wild woodlands and twisty paths dotted with rustic stone arches, mossy tunnels, and ornate bridges. Part forest, part fairyland, the Ramble is an easy place to get happily lost, or set a crime scene, which is precisely what we do in our forthcoming Coffeehouse Mystery, Once Upon a Grind (December, 2014). And that concludes our tour! Thank you all for coming and thanks especially to Dollycas for being such a kind travel agent. SOUVENIR? 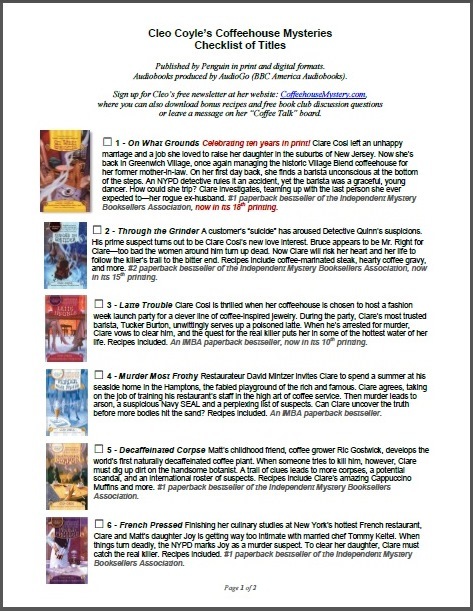 If you’d like a memento of your New York tour, Marc and I have a free title checklist for you of all 13 of our Coffeehouse Mysteries in order, including brief story summaries. To download the free PDF, click here. Cleo’s Newsletter: To sign up, simply write an email that says “sign me up” and send it to CoffeehouseMystery(at)gmail(dot)com. You’ll get a reply with a few past newsletters than include free recipes. CLEO COYLE is the pseudonym for Alice Alfonsi, writing in collaboration with her husband, Marc Cerasini. Their latest Coffeehouse Mystery, Billionaire Blend, newly released in its paperback edition, earned a starred review from Kirkus and a “Top Pick” honor from RT Book Reviews. Their next Coffeehouse Mystery, Once Upon a Grind, will be released by Penguin in December 2014. When not haunting coffeehouses, hunting ghosts, or rescuing stray cats, Alice and Marc are New York Times bestselling media tie-in writers who have penned properties for NBC, Lucasfilm, Disney, Fox, Imagine, Marvel, and MGM. They not only write the bestselling Coffeehouse Mysteries but also the popular Haunted Bookshop Mysteries. (1) A personally inscribed copy of the brand new mass market edition of Billionaire Blend (cover included in the blog post e-mail). (2) A set of glossy recipe cards with illustrated bonus recipes from Cleo. 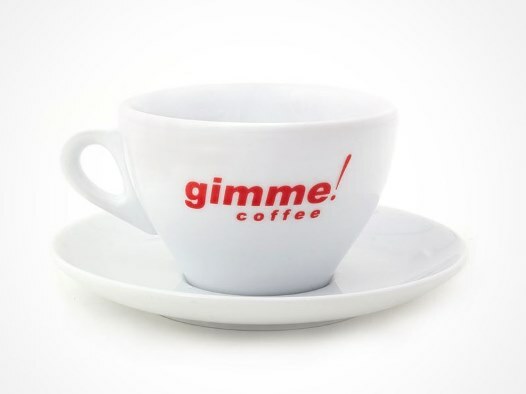 (3) A 16-ounce Gimme Coffee Latte Cup (made in Italy) and also great for enjoying soups and cereal. 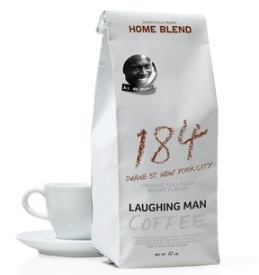 (4) A freshly roasted package of gourmet coffee from the Laughing Man Coffee Company, co-founded by actor Hugh Jackman to help coffee farmers in the developing world (all profits to charity). Loved the tour, and the giveaway package is awesome! I really enjoy the books. I love coffee! Thanks for sharing a bit of New York. Now I want to go back to visit and take in the sights. I have not been to the States yet … but boy, I love this place. Must read this. Thanks for the post. 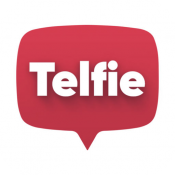 Hoping Canadians can enter….. could not find it anywhere. I enjoy your stories of New York. =) Your series is great! When your first Coffee House mystery was published I was sick and my nephew was going to BN. I asked him to bring me home a book..”just any book” said I. Well, it turned out to be a real goodie and I’ve been reading the series ever since! Thanks so much! Thanks for this wonderful feature. The photos and tour is interesting and special. Hi “Cleo”, like you I love the city and have spent many hours over the last 50 years exploring it. Although there are some parts of Queens I still need to explore… My best friend and I love finding new restaurants to visit and try out. The last one we did was Brooklyn Crab in the Red Hook area. It’s right across from the Fairway Market so you can’t miss it. I do love your books and can’t wait for the next one to come out. Love the books and this is a great give away. Thanks for the tour and reminders of some of what makes NYC so special. We lived in the west Village many years ago. It truly is a village. I really enjoyed your tour with the great pictures. Your books really look like I would enjoy reading!! Amazing giveaway! Thanks for the souvenir. In my few trips to NYC,I never got to Central Park. It seems like such a great place to visit. I’d love to get your recipe cards and try a few. I only got to travel to NYC once and then only for a day. I wish I could spend some time in that wonderful city. Thanks for your contest. There is so much to see and do in NYC!!!! Part of the reason why we are moving is becaue there is nothing to see or do. We tried, and tried so will find another area! Congrats on The Coffeehouse books success Cleo/Alice and Marc! My husband and I love them. How many books do you think will be in the series? Do you have a favorite book so far? Thanks. Thanks ever so much Cleo for the tour. I’ve never been to The Big Apple, I hear it is one awesome place to visit! I was told recently that coyotes live in Central Park…heads up! for those who stroll. Many thanks Cleo and Lori for a pleasant time here today. Wonderful tour – thank you! I think everyone should take tours of their own town. I know there is much of mine that I have never seen, or seen since it has been renovated. Love your books. I love the NY tour. This series sounds great – I’ll look out for them. Love this series, can’t wait to read this one. Cleo I have discovered your Coffeehouse series and love them. I’m looking forward to read more books from this series. Thank you for the giveaway. Thank you, Cleo for sharing this with us. The photos are wonderful, as is the giveaway! Love the NYC tour and pictures. I really love Clare and the great cast of characters in your Coffeehouse series. Love the books and recipes. Thanks for the tour of NY. We lived there in the early 70’s and would love to go back. Please keep writing! I own almost the whole series on audio, it’s awesome ! Great series & great giveaway! 16oz of great coffee! Would live to start my day with that! Enjoyed the NYC tour, with book notes! Thanks! 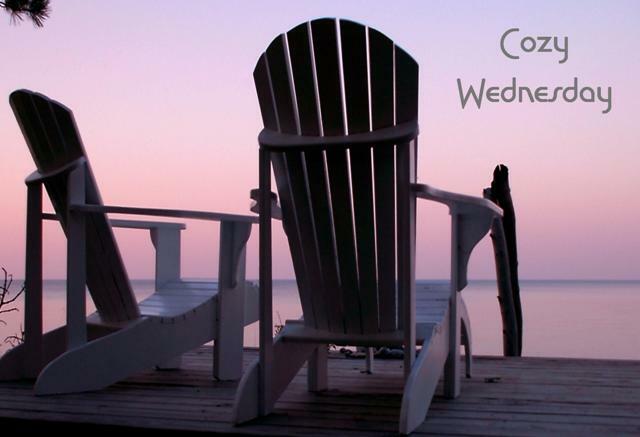 This is my favorite cozy series – I just can’t get enough! 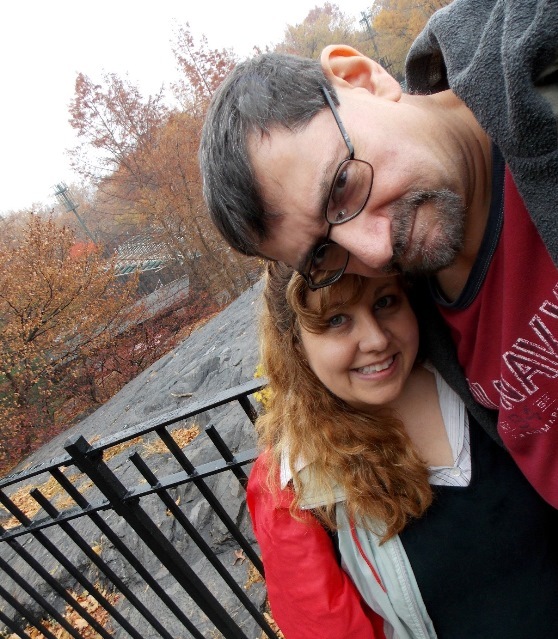 Thanks for the personal tour, I love NYC and you showed me a couple of new places to visit. What a terrific tour of NYC without having to leave home! And coffee, coffee, coffee – always love it and the series. I love the whole cozy mystery genre. They are my favorite books to read. Will have to check out this series. I like to read series books best of all. I’m popping in to say THANK YOU to all of you who left such kind comments and entered our giveaway. I appreciate it! I also want thank Dollycas for being such a wonderful travel agent/hostess on our Escape to her gorgeous blog. Marc and I hope to be back again soon! I love all the coffee house mysteries. Listen to them all on Audible and think that adds lots to them. I have learned so much about coffee and NY in your books. 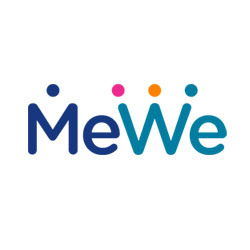 Fun to learn about you all more here!! The coffehouse mystery series has become my favorite cozy series. I swear the longer I read the more I can smell the coffee! I absolutely love your Coffee House Mysteries. What a fun tour through New York. I’ve never been there. I love reading these books and this post gives some great information on what to visit when in the city! I love this series and always look forward to the next adventure. You guys are a riot. I like the books and I love the recipes. I’m very sorry to hear about Turtle. I have cats too and my Emma looks like like Turtle. I love seeing NYC through other eyes. My favorite place is Rockefeller Center and Central Park. 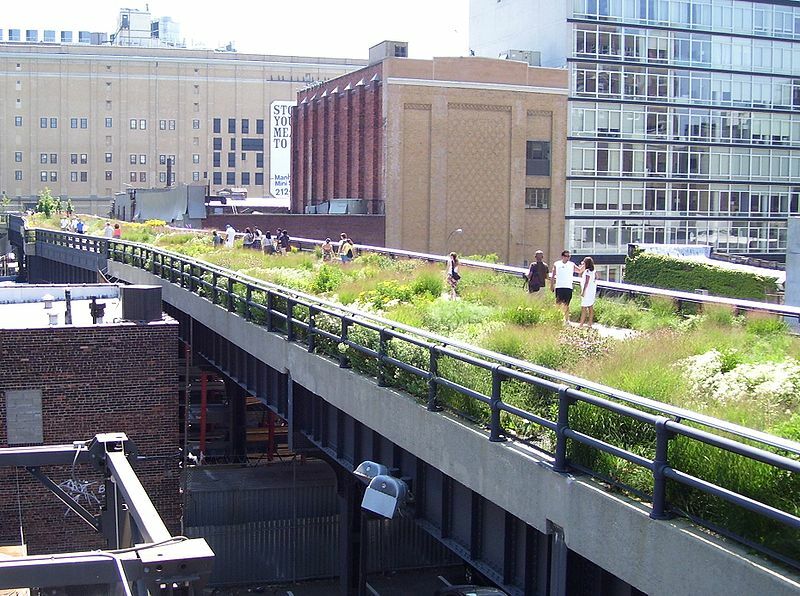 I’ve never been to the High Line. I am not acoffe drinker, but really like the books and recipes. So sorry on the loss of your fur baby. Can’t wait for the new book! So addicted to this wonderful series of mysteries. Looking forward eagerly to Once Upon.. I love your series and also your newsletter. What a wonderful tour! I love the series! I really like you’re Coffee House Mystery Series. Sorry to read about you’re cat passing away. We have a very spoiled cat named Toby, his about 7years old. My oldest daughter Michelle had a friend drop him at are apartment door knocked and left I opened the door and there he was sitting next to his box which had a hand towel a toy and a plastic bag of kitten chow. His my and my husbands best friend. Thank you for great books, keep them comming. Hi Cleo/Alice: Before anything else, I am sorry to read about the loss of your kitty. We lost three within two years, one 26 plus one 23 plus and one 19, so I know how many memories you have just as we do and we must think of those when they are gone. My sympathy to you both. Next, I loved the trip down Memory Lane of NYC; it has been awhile since we have been able to do any type of city trip and this just gave me a lot of reflection to see and read. Thank you for that. I can hardly wait to read Once Upon a Grind. Wish I were on one of your advanced reading lists as I sure would love to get this read and reviewed for you. Your series has been one of my all time favorites. A few new other type of cozies have filled in and some very well, but your coffeehouse series is just one that I adore and cannot wait for each and every subsequent book. I sometimes reread the previous ones to get me though to the next one coming out. Claire has become like an old friend to us readers and we want the best for her but adventures await and you cannot have the good times seem really good without the bad times, I know. You two do a magnificent job with all of your writing so we all know that each and every new book will be as good or even better (if that is possible) than the one before. I am still doing a lot of reading being confined to sofa or bed for almost 8 months now and many more to come according to the doctors at the hospital after my recent month of treatment so thank the good Lord for books and an e-reader to keep me sane during this long healing process. Hoping that you are both doing well and again, so sorry about your loss. 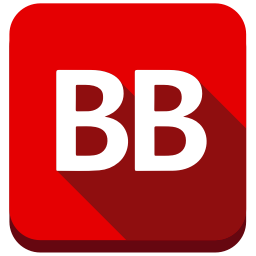 Also thank you for the great prizes that you are offering to one of your readers. You are so giving and thoughtful. Take care. I love coffee and each and every one of your books. Thanks so much for this New York tour and may you and your husband bring us many more witty and wonderful books in the future. I’m really saddened to hear of your loss. Been there and done that this last year with my kitty of 13 yrs. But! in other mentions, I’m so thrilled with the new book coming out. I get really excited when you mention a new one and I’m on it like glue to paper. I collect your books for the great reading and the recipes. You know I can’t even pick a favorite amongst your works.